Recently we were on a road trip. My recent post about the lighthouse was part of this trip. She-with-better-taste and I decided to stop in Savannah GA. on our route up to North Carolina. Many years ago (don't remember exactly) we spent a few days in Savannah at a very nice B&B. Our journey this time was from the Florida panhandle to north of Charlotte NC. I wasn't keen on driving around the busy Atlanta area so we went up I-95 which goes near Savannah. She-with-better-taste suggested that we stop and eat at Lady and Sons restaurant. During our stay years ago we ate at an earlier Lady and Sons location (think it was Paula Deen's first one). Awesome delicious food. Our timing was prefect. We arrived around 4 pm but had eaten little on the long drive so we were hungry. I noticed a sign on the door telling customers that there might be some filming taking place. We got seated right away. Soon after the waitress finished taking our order a young woman approached us and asked if we would mind being filmed. She also told us we would get a free dessert and a surprise. We quickly agreed but I was a little worried I end up with a parking ticket if it ran long. The parking is a bit more of problem than I recall from our first visit to Savannah. After we filled our plates from the great buffet and sat down we noticed the crew starting to setup. I called the young woman (director, film crew manager?) over and asked where makeup was. She chuckled and told me that group didn't come along for shoot. I probably could have used the makeup but at least she-with-better-taste reminded me to take off my hat. The surprise was a delicious pecan pie delivered by Paula Deen herself. We were shocked. Paula is southern charm all around. We could have talked with her for hours. It was not long before smartphones were pointed at our area from all directions. A line formed to get selfies with Paula. I've been looking on youtube for a video taken by one of those smartphones. Also, I learned the filming will shown on Paula's Evine channel but have not found it yet. Thankfully my wife thought of taking this picture of Paula and me. We sent the news of our surprise to the relatives and her brother texted back "Paula Deen and Colonel Sanders must be great chicken". 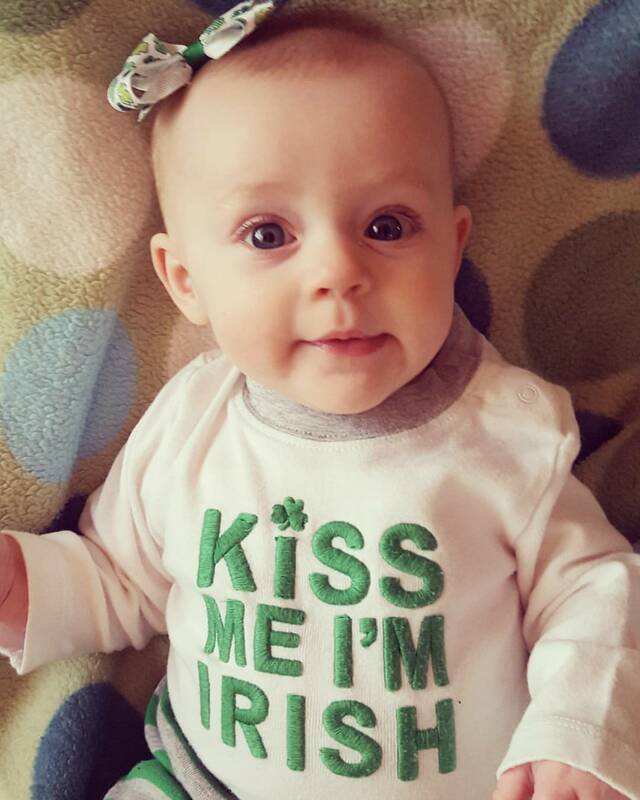 Lastly: St. Patrick's day is just a hours away as I post this so here's a St. Patrick's day greeting from our youngest granddaughter.